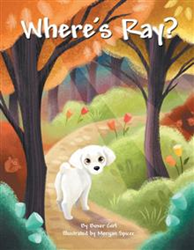 Kelli-ann marks her debut in the world of children’s literature with the release of the children’s book “Where's Ray?” (published by Trafford Publishing). Written under the pen name of Boxer Girl, this vibrant storybook follows the Ray of the title, an adorable white dog who unexpectedly finds himself at the center of a magical adventure. The storybook opens with a group of children happily gathering at a playground right after school and Ray enjoys their company. The little dog is startled when he hears the loud sound of a siren. He is so distressed by it that he runs off. Before he knows it, Ray finds himself entering an unfamiliar place – a forest filled with strange sights and sounds. The dog could not help but be enchanted by the new place. What will Ray find in the forest? Can he make his way back home? In her debut publication, Boxer Girl not only engages readers with fun antics of the lovable title character, she also imparts a valuable message about self acceptance and believing in oneself. Accompanied by delightful, full-color illustrations by Morgan Spicer, “Where’s Ray?” is a wonderful tale that will warm the hearts of readers of all ages. Boxer Girl is the pen name of Kelli-ann and is inspired by her love for dogs, particularly the boxer breed. She loves the outdoors, warm weather and everything related to creativity. “Where’s Ray?” is her first children’s book.